Do you know the legend of the Traveling Gnome? Otherwise known as the traveling gnome or the roaming gnome, the popular photography prank is performed through when when someone brings a garden gnome lawn ornament on a trip and takes pictures of it in front of famous landmarks. Some of these roaming gnomes have even become national and international news stories, especially when someone takes a garden gnome from an unknowing person's lawn and then sends the owner photos of the gnome traveling the world (but returns the jet-lagged gnome back to their yard when the travels have come to an end). There’s even The Garden Gnome Liberation Front in France, which is a community dedicated to “freeing” gnomes and “returning them to the wild” by stealing garden gnomes from other people's property without the intention of returning them (as you can imagine, this has sometimes led to criminal charges, jail time, or fines. 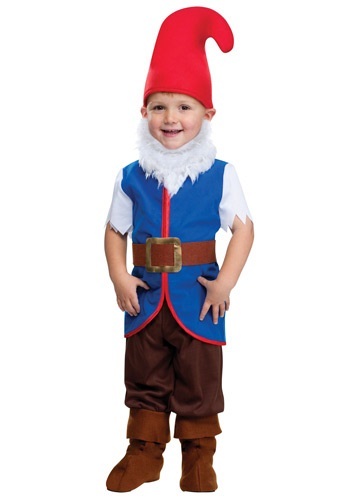 So if your little guy also has a penchant for adorable pranks and world travel, there’s no better, more adorable, beloved costume than this Toddler Gnome Boy Costume!